Ralph Breaks the Internet is stealing hearts and our family is ready to enjoy this film as a part of our Disney Movie Collection. One thing I love to do with our favorite movies is creat character cupcakes. In honor of Ralph Breaks the Internet, I am sharing my Vanellope von Schweetz cupcakes today. If you are looking for Wreck-It Ralph cupcakes for your next movie night, you’ve found them! Vanellope von Schweetz is probably one of the most beloved characters in the Wreck-It Ralph movies. Since she is so sweet, she deserves her very own cupcake theme. With a few simple decorative ingredients, these would be perfect for even Wreck-It Ralph cupcakes themed for a party. Bake your favorite chocolate cupcake mix and let cupcakes cool completely before decorating. Frost the top of each cupcake with chocolate cupcake frosting. I like to use a plastic storage bag, fill it with the frosting mix, and cut a small piece of one end to whip the frosting on top. Using the red vines, cut the ends by just about 1-2 inches. You want just enough to not poke it through the entire cupcake but have some of the ends peeking out on top. This gives the look of Vanellope’s hair tie. Using the sugar gems and pearlized sprinkles, place them on each side of the cupcake to mimic the candies found in Vanellope’s hair. You can follow along with a photo of Vanellope to make it similar or create your own look. Whatever you desire. Serve these and enjoy. Be sure to store them by a cover with foil or a container to keep them fresh. 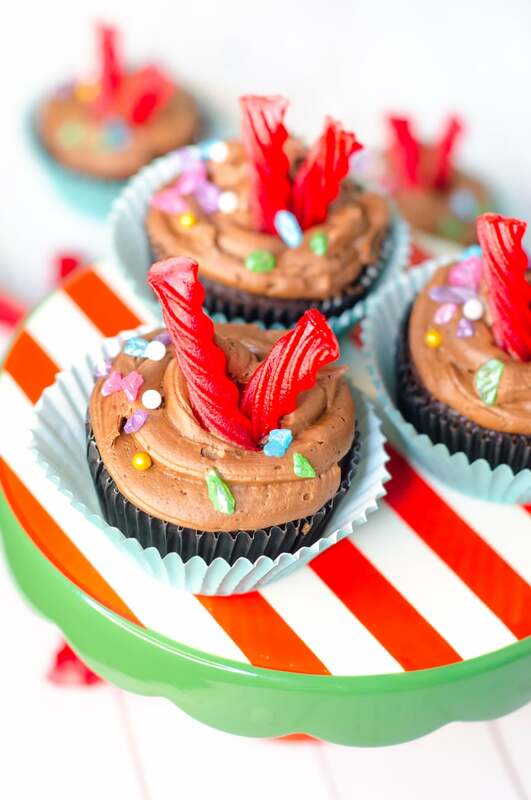 These Vanellope von Schweetz cupcakes are sure to sweeten any Wreck-It Ralph movie night or themed birthday party. Be sure to catch Ralph Breaks the Internet this holiday season and share with me your very own Vanellope von Schweetz cupcakes by tagging me on Instagram. I always enjoy seeing how my ideas turn out for others. Especially if they bring joy to your home too. Vanellope von Schweetz Cupcakes - Wreck-It Ralph Cupcakes are the sweetest for a Wreck-It Ralph Themed Party. Bake your favorite chocolate cupcake mix and let cupcakes cool completely before decorating. Frost the top of each cupcake with chocolate cupcake frosting. Using the red vines, cut the ends by just about 1-2 inches. Carefully insert the red vines into the top of the cupcake to create Vanellope's hair tie. Using the sugar gems and pearlized sprinkles, place them on each side of the cupcake to mimic the candies found in Vanellope's hair. Where can I find a red and white cake stand like the one featured? I hope you are able to find one like it!